October 20, 2016 – A visit to the B-2 Test Stand at Stennis Space Center leaves no doubt – NASA’s return to deep-space missions is drawing closer by the day. And the days until the flight stage that will launch the return is tested at the site are fewer than one may realize. Before launching the new Space Launch System rocket on its first test flight with NASA’s Orion spacecraft, the agency will deliver the core stage for the flight to Stennis for green-run testing. For the first time, the stage will be assembled with its four RS-25 engines, installed on the stand and test fired, just as during an actual launch. Including evaluation and design phases, Stennis has been preparing the B-2 stand for core stage testing for five years and counting. It has been a busy time, but major construction projects are closing out and all is on schedule with just a year or so remaining, said Barry Robinson, manager of the B-2 Restoration and Activation Project at the site. It has been an involved process that mirrors work done during the Main Propulsion Test Article Project at Stennis in the 1970s, when a space shuttle external tank, simulated orbiter and three main engines were installed on the stand and test fired just as during an actual launch. Now, the stand will provide a sequel of sorts with its test of the SLS core stage – with a very big difference. This is no SLS mockup; the stage to be tested will actually fly. The work to prepare the stand for the stage testing was divided into three phases: restoration of the stand to its original design condition, buildout of the stand to accommodate the larger SLS core stage and completion of the special test equipment interfaces (structural, mechanical and electrical) needed for testing. Robinson and others on the B-2 Test Stand restoration team are paying heed to every detail to make sure all is ready to go for the stand. Major restoration and buildout efforts have been completed. Some of those were sizable, such as extending the derrick crane atop the stand by 50 feet, repositioning the 1.2-million-pound original shuttle MPTA framework structure, adding another 1 million pounds of steel to extend the structure to accommodate the larger SLS stage and upgrading the massive high-pressure industrial water system to provide as much as 335,000 gallons of water per minute to the stand during test operations. A weekly summary of test complex activity shows only three of five original work packages still open. Much of the remaining work on those packages involves completing equipment systems and final punch list items. Necessary upgrade work continues at the high-pressure gas facility that supports test operations. Work on the test stand tarmac is scheduled for completion in December. All of the packages are expected to be closed out in the next few months. Some subsystem activation work already has begun, but the major activation efforts will occur this spring. The goal is to be ready for the April arrival of the core stage “pathfinder,” a full-scale mockup of the SLS core stage. It will be installed on the stand for a critical “fit test” to make sure the stand is configured as needed for the actual core stage. That will leave summer months to make any modifications that may be needed and to ensure all aspects of facility and test support systems are ready. The time is vital. The RS-25 engines that will power the SLS core stage are former space shuttle main engines, so Stennis has a long test history to build on in that respect. However, the SLS vehicle itself – and all of its configurations – is new, which poses challenges in preparing stand systems for testing. Once installed, the core stage will undergo chill-down and hot-fire tests. Per current plans, the actual SLS core flight stage will be delivered to Stennis for testing next fall. The timing would be perfect from a historical standpoint. 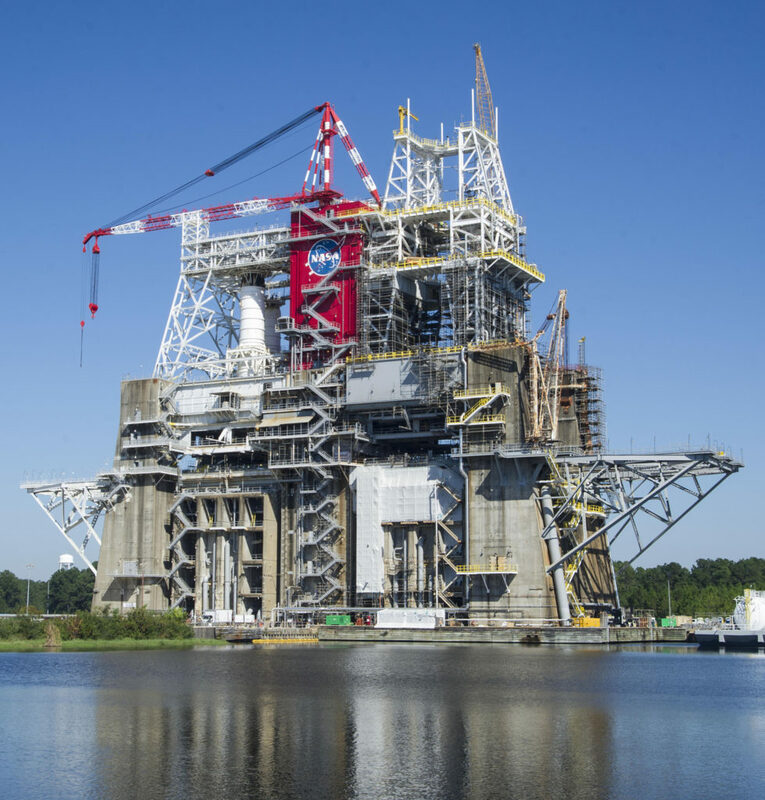 The first shuttle MPTA test was conducted 40 years earlier, in 1977, making 2017 a perfect time for Stennis to add another chapter to the B-2 Test Stand “finest hour” record.